(ACM) Association for Computing Machinery providing full-text repository of leading-edge publications, conferences, and other career resources. 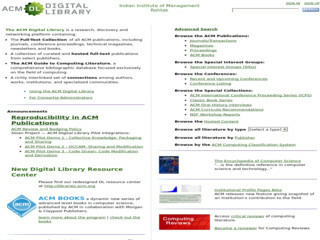 It covers more than 400,000 full-text articles dating back to 1951, the ACM Digital Library is the premier online resource for computer science research. Included on the platform are more than 60 high impact journals, 3,500 conference proceedings volumes, 30,000 articles from the ACM Special Interest Groups (SIGS), and 6,500 multimedia files. © Copyright 2016 INDIAN INSTITUTE OF MANAGEMENT ROHTAK. All rights reserved.